Warmer weather has certainly arrived in Vancouver earlier than usual this year, which roughly translates to a long-lasting, durable allergy season. 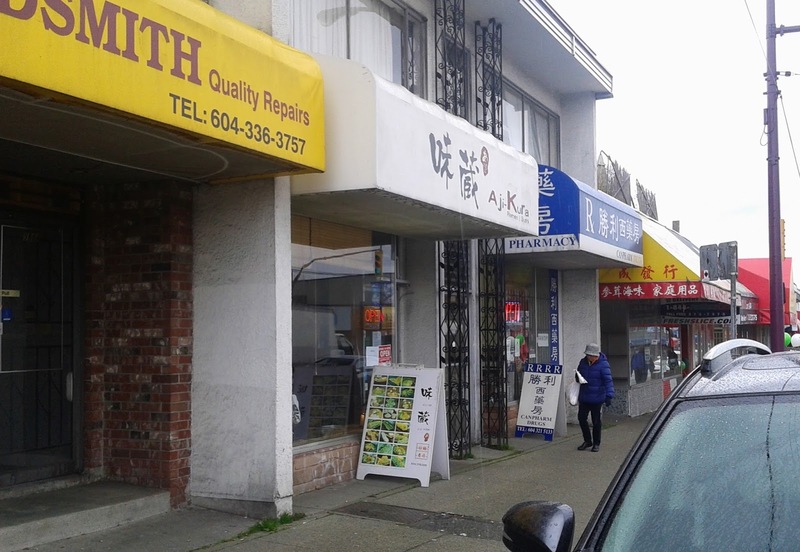 With my nose running like a boss, I went to visit Aji-Kura, a relatively new Japanese restaurant located on Victoria Dr. in one of Vancouver's various Chinatowns. As I had expected, the restaurant is Chinese-operated, and the food on the menu appeared to be quite budget-friendly. The restaurant is not very large, but it features clean, modern decor. The menu is also quite extensive, so in order to try both their ramen and their special rolls, I decided to do a Sushi-a-thon. 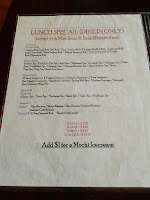 Best of all, they showed consideration for my sushi needs by including special rolls in their Lunch Special menu. 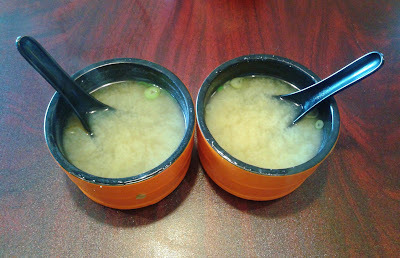 The two miso soups came from the Lunch Special combo and the donburi I ordered. With green onion and seaweed, the soup was standard fare. Although the consistency of the soup was on the thinner side, I liked how it was not too salty. 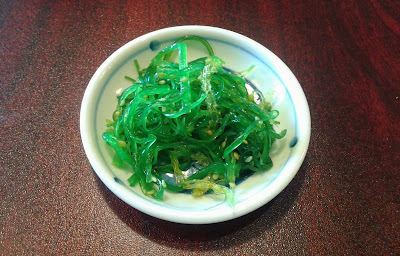 The Lunch Special combo also came with a small portion of Wakame, which was amply dressed and came in thin, easy-to-chew pieces. Being a very mature person, I decided to pick the most appropriate special roll: the 69 Roll. I mean, if I can't experience the 69 in real life, then at least I can experience it through sushi, which probably works just as well. 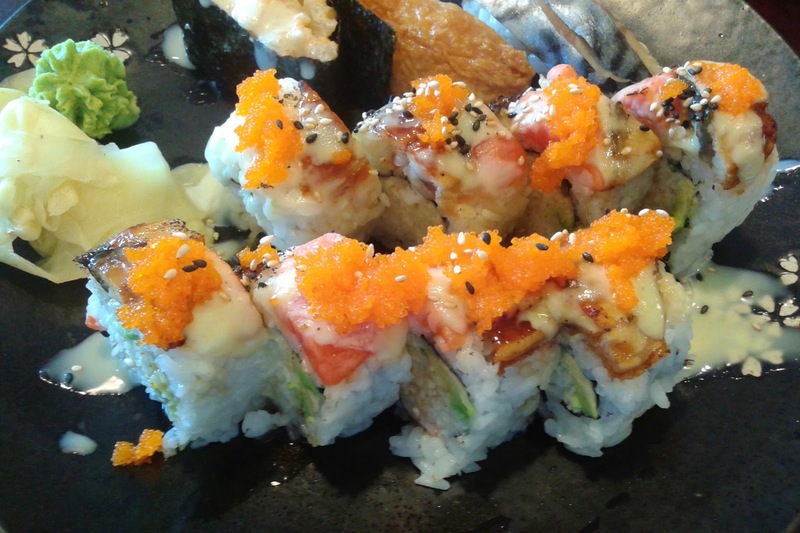 The 69 Roll came with torched wild salmon, unagi, cucumber, crab meat, and avocado. 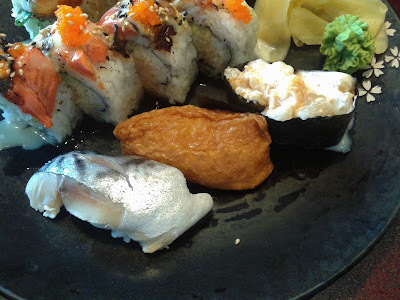 The salmon exhibited a good amount of searing, and the roll featured savoury unagi as well as copious amounts of crab meat. The pieces were on the larger side, and the roll was decent texture-wise. I decided to pair my 69 Roll with some nigiri, and the nigiri demonstrated good rice formation. The saba was chewier and smoother in texture than expected, but fortunately, it was not too salty. The inari was sweet and juicy, and it would be great if the rice was also seasoned. The Chopped Scallop Nigiri was amply sweet and came with a good balance of ingredients, but I had to deduct some marks because the seaweed was falling apart. 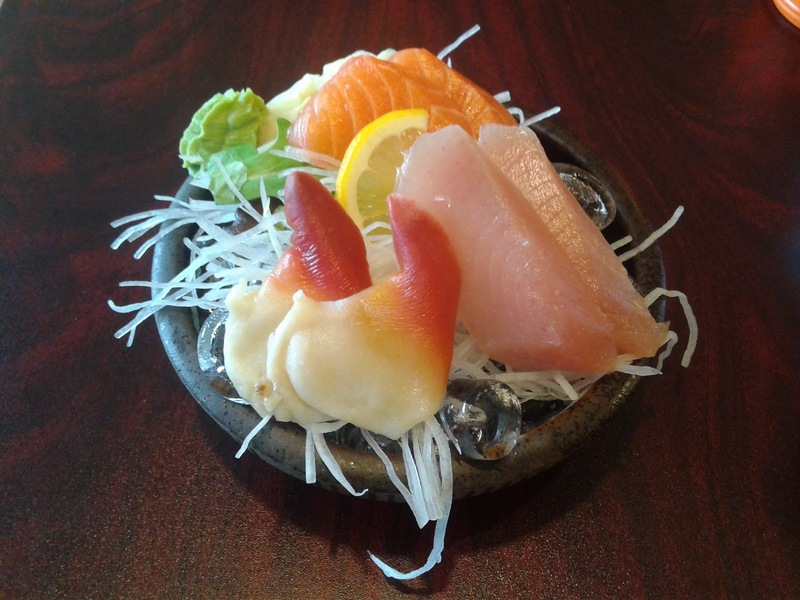 After the combo, I tried some of their raw fish via the Appetizer Sashimi. The Salmon Sashimi had a delectable smooth sheen and was sliced generously, though I had to dip it in quite a bit of soy sauce to get enough flavour. The Tuna Sashimi was served too cold, and after letting it sit for five minutes, the interior was still frozen. Unfortunately, tuna popsicle is not exactly one of my favourite foods. 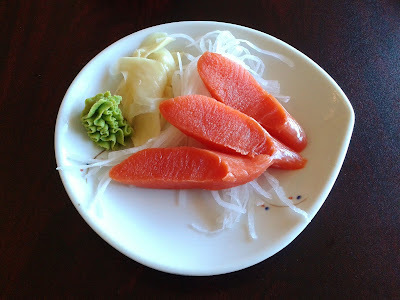 Moving on, the Hokkigai Sashimi had an appealing chewiness and demonstrated superior freshness. Finally, I was presented with a huge Ebi Mayo Don. With six tempura prawns and a large bed of rice, this was easily twice the size of what I was expecting. Now, I don't know what kind of high I was on, but I managed to finish the whole thing (along with everything else above). I enjoyed the texture of the sushi rice, which had an appealing amount of stickiness and was amply dressed with mayonnaise. The small piece of lemon added a nice citrusy touch. 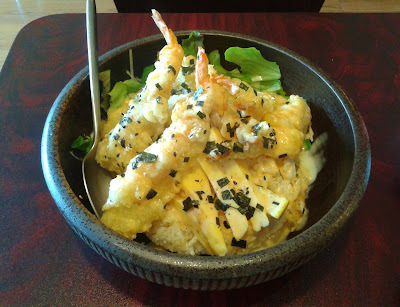 The batter on the prawns was on the thicker side, and the tamago was not particularly outstanding. Since the Lunch Special combo was such a good deal, I ordered from it again, but with ramen instead this time. This is literally the first time I have had ramen since I started this blog. Do not worry. To make sure my rating was reasonable, I ordered the same dish at Hokkaido Ramen Santouka soon after this visit to do a comparison (I'll also admit that what really lured me into Hokkaido Ramen Santouka were their ice cream floats). While the tonkotsu-flavoured broth was no match for the heavenly broth at Hokkaido Ramen Santouka, the pork here was actually better. 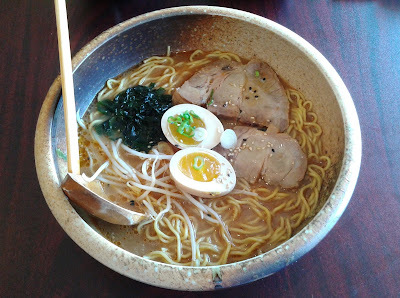 It was very tender and savoury, and the ramen noodles exhibited that distinctive ramen flavour well. Next, I went for the three-piece Sockeye Salmon Sashimi as part of my Lunch Special combo. Sliced into quaint elliptical prisms with a shear in the horizontal direction, the sashimi demonstrated questionable knife skills. It had a mild, sweet flavour but was not particularly smooth in texture. At just $9.25, this was an excellent deal, and the oshizushi was presented beautifully. 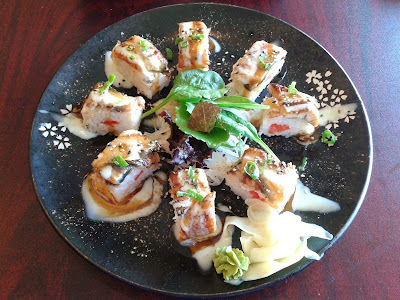 This particularly oshizushi featured torched eel, wild salmon, yuzu, and creamy sauce. The construction of the individual pieces could have been neater, and the rice was slightly too dry this time. I also found the unagi overly chewy, and the tangy yuzu was not the best match for the sweeter unagi. To sum it all up, the sushi tasted okay, but the texture was problematic. For just $1 more, I added the Black Sesame Mochi Ice Cream to my combo. This took a long time to come out, but since I wasn't in a hurry, I sat there and stared at my empty plates to see if they had forgotten about my ice cream. It turned out they did. 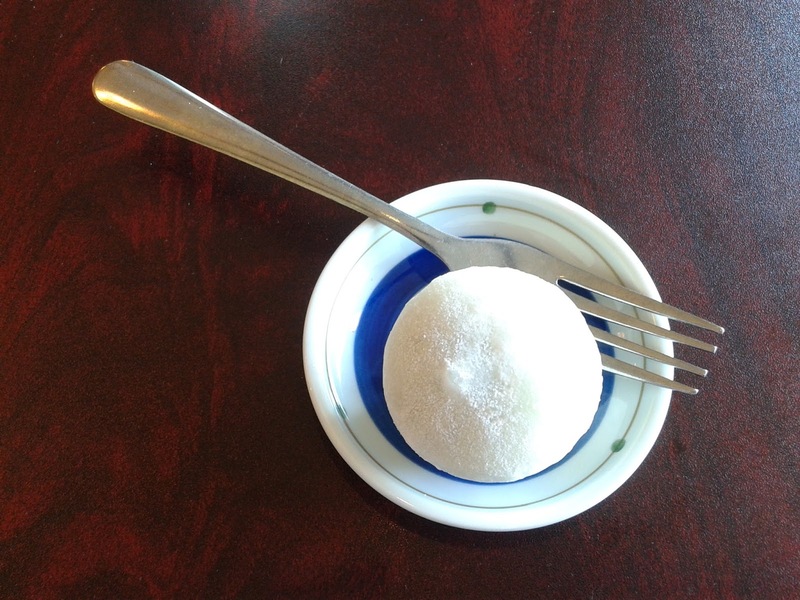 When it did come, I found it slightly too cold, but the mochi had an enjoyable soft texture. It would be nice if the black sesame flavour was richer. I wasn't a big fan of the service, as it was rather unenthusiastic and the waitress seemed to be having a bad day on both occasions. However, my wallet was a big fan of the prices. Overall, if you look past the service, Aji-Kura is a case of satisfactory food for very good prices. Perhaps the next time my mom goes shopping for groceries and weird Chinese soup ingredients in the vicinity, I can stop by to try more of their enticingly named special rolls. Did you try the 420 roll? I heard it was really good! I must have missed that when browsing through the menu. I can try it on a future visit! "Perhaps the next time my mom goes shopping for groceries and weird Chinese soup ingredients in the vicinity"
LOL - Everytime we stop at Victoria Dr., my mom likes to browse through all the grocery/herb shops, and since I like actually eating more than looking at food ingredients, I often find myself with nothing to do.